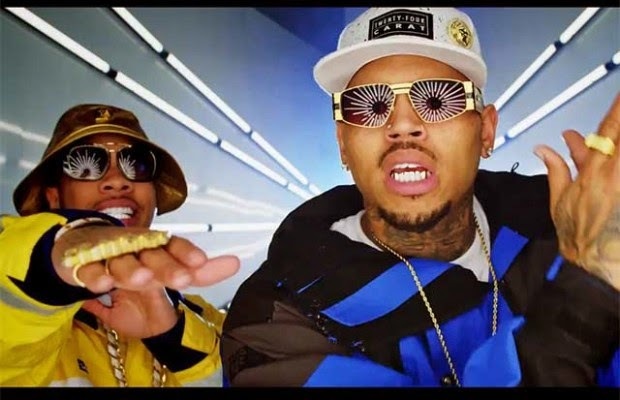 Chris Brown and his buddy rapper Tyga have released their new visual for their new single, "Ayo". The video is a shout out to flashy vids back in the day like JD and Jay Z's Money aint a Thang or Puff and Mase's Mo Money. In the video, Chris chills in his money pool and Tyga makes the ultimate brag with an all gold toilet fit for a king. Of course the video has the pretty ladies in bikinis walking around and a few of CB and Tyga's flashy cars. My favorite scene was unexpected! Comedian Mike Epps appears out of nowhere and cracks a few jokes about Chris and community service before he sets out chasing down the two stars in their lambos. I actually laughed a bit. Check out the new video for Ayo below. The song is the lead single from their long awaited Fan of a Fan duo album.